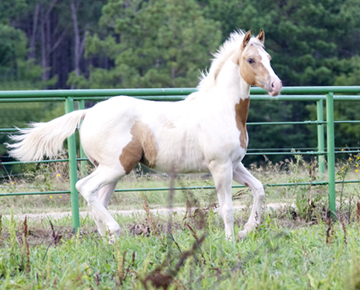 Kharrie's sire is the APHA stallion, Sonny Butterscotch. His pedigree are champions including Silky McTavish, APHA National Champion Western Pleasure, Cutting and Halter and sire of FIVE World Champions and three Reserve World Champions. Diamond Jim, the only son of World Champion mare, Sallisaw Rose, earned 23 halter and five Western pleasure points. In 1974, he was shown to Grand Champion Stallion honors at the Houston Livestock Show and Rodeo. Jim's son, Diamond Eyes, was a Superior Halter Horse and top sire.